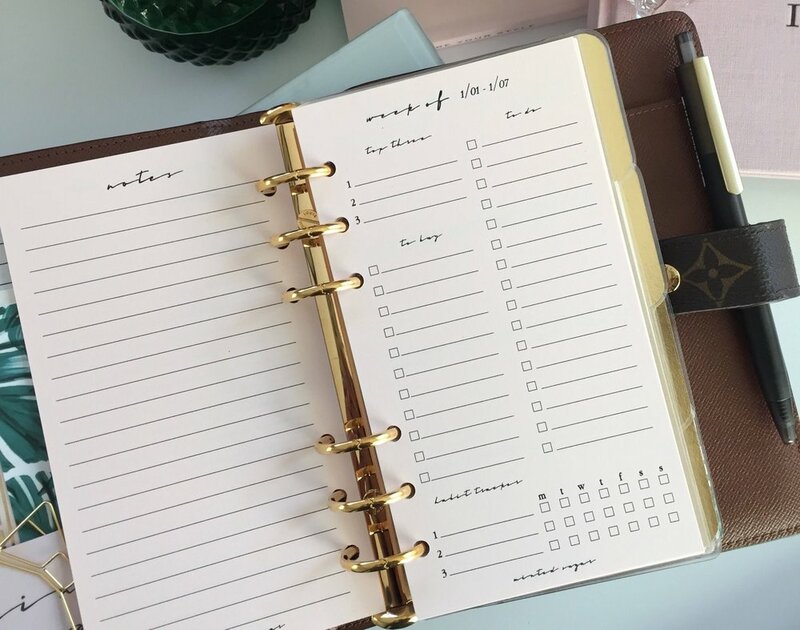 2019 Goal Planning- How to Set Goals & Achieve Them — Beauty and Etc. It’s that time of the year to reflect on the good and the bad from the previous year. Each year we set goals and resolutions- some realistic and some unrealistic. I'm already past the notion of the regular resolutions such as “I’m going to go to the gym 3x a week” and “I’m going to save _ amount of money”. I started to approach the topic of planning for the New Year more realistically. If you’re interested in finding out how, keep reading!! Personally, I’m the kind of person that needs to write things down in order to remember them. I’ll temporary use the calendar on my phone and then transfer the information into a paper calendar. I carry around a mini planner with me everyday. I love being able to plan on the go. This allows me to visually see upcoming important events and things to do. Over the years I would buy a new medium size planner every year and then somewhere midway through the year I would stop using it. I decided to invest in a small planner cover and size that would allow me to bring my planner with me everywhere. The fact that I spent a little more on this planner makes me want to use it more to get my money’s worth and I also love how chic it looks. I enjoy using a paper style planner (picture below) to focus on the planning of my blog and Instagram content. The small size makes it perfect to carry around. I love that I am able to write down ideas as soon as they pop into my head. I also use a separate planner that’s a bit larger that focuses on other events such as bill paying, birthdays and etc. Digital planning can be done with the use of the cell phone/tablet with the use of various apps. The calendar app that comes with the iPhone is extremely easy to use. I find it helpful for day to day events such as doctors appointments and other events that are based around a specific time. I also like the fact that I could use Siri at a moments notice to quickly add an event to my calendar. Check out the example below to see how detailed you can organize your schedule by using the calendar app in your iPhone. ﻿How to set goals and achieve them? Now that we discussed the methods of record keeping, lets discuss what to record. As I mentioned, I have two planners in rotation. My main planner is my mini Louis Vuitton agenda, which I use to plan blog and Instagram content. I like to record and keep track of the engagement of posts along with planning future posts. I like to set goals that are specific and that can also be measured- “X amount of blog traffic per week”- this can be measured by studying the analytics from my instagram and my blog. I try my best to keep my goals as realistic as possible. Writing down goals makes them realistic and more understanding for me. I try not to make too many goals per week and not to beat myself up afterwards if I’m not able to achieve a goal. A few months ago I used inserts that contained Habit Tracking. Some of the few habits that I tracked weekly were taking vitamins, getting up early, drinking enough water. If you’re interested in purchasing something like this, it can be found on Etsy from Minted Sugar. I like that these inserts also have a to-do list, a to-buy list and top three things to focus on for the week. Turning a goal into a habit for me means focusing on something that I’m actively trying to achieve on a daily basis. They say a habit is formed out of routine behavior. The more you focus on this behavior along with putting forth the effort to achieve them, the easier it’ll become to do it. I’ll list below some of my goals/habits that I’m looking to achieve this year- along with how I plan to achieve them. Every single year I say to myself that I will complete one of those money challenges that you often see floating around online towards the end of the year going into the new year (picture and link below). I’m still going to attempt to do one. But this is going to be my backup option. My goal for saving money this year was first looking at the money I already have saved and then coming up with a total number that I think could be saved. The number that I came up with I figured how much would need to saved monthly. Instead of deciding to try to transfer the money each pay week into my savings account, I decided to have the money directly deposited into my savings account from my paycheck. I feel like with this course of action I don’t have to think about transferring the money myself and forgetting to do so. Although money challenges have not worked for me in the past, I would still like to complete one. I’ve listed a few below that I was able to find online. Each one is linked. Please feel free to visit these sites to get more information. I know many people are starting off the New Year with a No Buy Challenge. I gave it a lot of thought, but decided against. Some of the best deals are after the holidays and I didn’t want to limit myself just yet. I guess you could say I’m currently on a Low Buy. At the current time I’m trying to focus on using up products that I have before I purchase new products. It’s not to say that I won’t try to achieve a successful No Buy Challenge later in the year. I hoping to put this in place later in the year around April or May. If you’re interested in seeing the results from my First No Buy Challenge, Check Here. Knowing what I know now, I plan to approach my future No Buy Challenge differently in the future. Paying Off Bills - bill planning before I get paid. This means scheduling payments early and budgeting. Getting Back to the Gym- as of right now my schedule doesn’t really allow much time to get to the gym as many times as I want. I would like to start with heading to the gym at least 1-2x a week. I find this number to as be more realistic for instead of saying I want to go 3x a week and getting upset when I’m unable to. Reading More - I currently commute to work. I would like to use this time to read more. At one point I was reading 1-2 new books per month. I would love to get back into this habit and possibly even join a book club in the future. Until then I think the best way to achieve this is start by carrying a book with me everyday, therefore I won’t have to remember as the book will already be with me. I hope some of my habits that I’m putting in place with help some of you this year. In the meantime I would like to hear from you to see what you have planned for the New Year. Please feel free to leave them in the comments below.